Recently, I came across a blog post featuring Sweet Potato Chips that immediately grabbed my attention. Why? Because these crispy, sweet chips were cooked in the microwave in mere minutes with absolutely no oil. Uh yes please! I had to try it out immediately. I was beyond impressed when it actually worked. They tasted and crunched just like you’d expect from a regular fried chip. An entire sweet potato was demolished in minutes. Without the salt these chips were still great and made a perfect toddler snack from little m. A great way to sneak in more veges. I was intrigued by the possibilities of the microwave chip technique – what other vegetables could be chippified in this manner?… Butternut? Zucchini? Eggplant? Carrots? I had to find out! 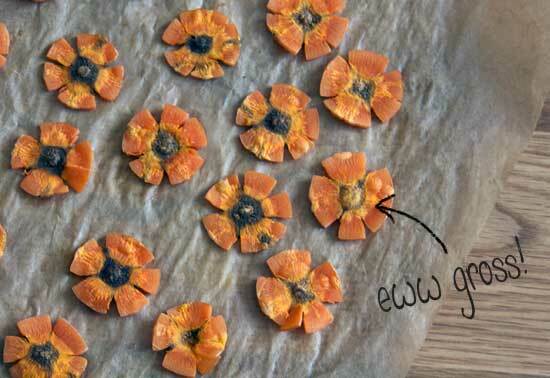 Method: I sliced all the vegetables thinly (1-2mm) and cooked them on a sheet of microwavable baking parchment. I started by cooking on full power for 2-3 minutes then turned the chips and put back on for another 1-3 minutes. You need to keep a close eye on these as the cooking time will vary a lot depending on the power of your microwave, how thick the slices are, and the water content of the vegetables. Aubergine (aka Eggplant) – Has potential. Crisped and crinkled in a nice way but the taste was lacking. Perhaps with the right seasoning and a great dip these would be better. Failed the toddler test. Parsnip – Disappointing. These looked great – firm with a nice wavy crinkle to them. But, they were tough and tasted bland, like raw parsnip cardboard. Butternut – Success. Sweet, crispy chips, much like sweet potato. These were great to eat and also passed the toddler test. Apples – Success. I altered the cooking time/power level for these and they came out pretty good. 3 minutes on full power then 5 minutes on 30%. Passed the toddler test. Courgette (aka Zucchini) – Disaster. I suspect that the high water content in zucchini just doesn’t cook well using this method. They were soggy till they were mostly burnt then they went soggy again after cooling. Also tasted pretty bad. No surprises here really. Carrots – Mixed results. For some reason the centre of the carrots cooked much faster than the rest. This resulted in charred, inedible centres while the rest of the carrot was still soft. I tried a second batch with holes punched out of the centre, these worked well and passed the toddler test… But the slicing and hole punching is a lot of work just for a handful of carrot crisps. Beetroot (aka beets) – So pretty! I didn’t enjoy the taste of these as much as I expected to but they were ok. 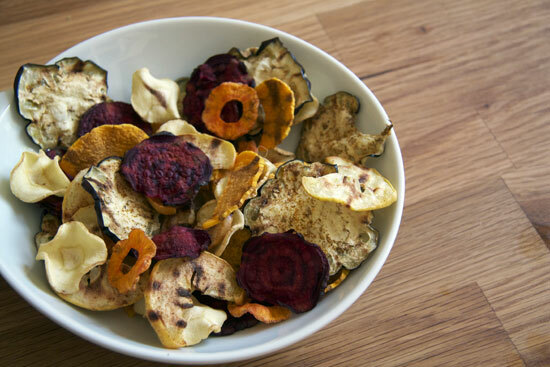 These are probably best in moderation – sprinkled into a mix of other vege chips to add some colour and variety. I’d definitely make the sweet potato and butternut chips again and will probably experiment further with the apple chips too.